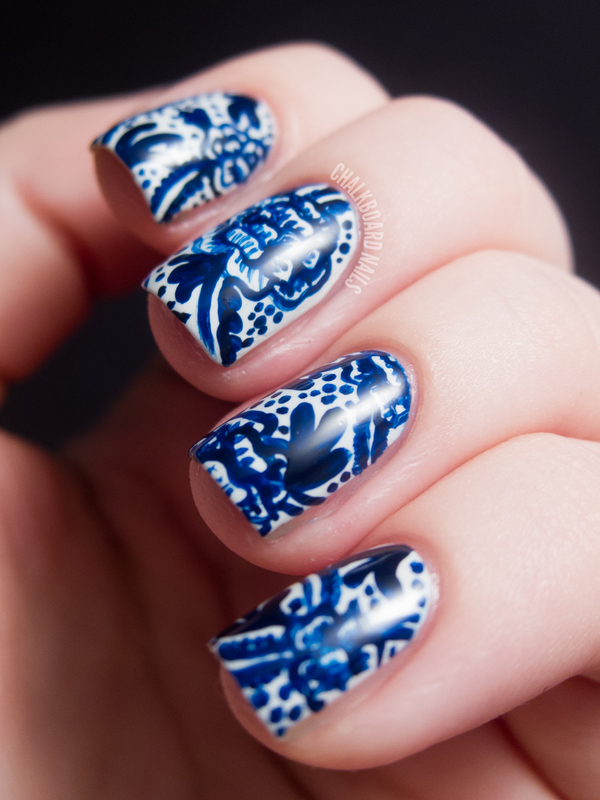 When trying to decide what to do for my blue day nails, I started thinking about beautiful blue and white china patterns. I wasn't sure of the history of this style, but have since come to learn a lot more about it (thanks Wikipedia)! They start with a base of OPI My Boyfriend Scales Walls. 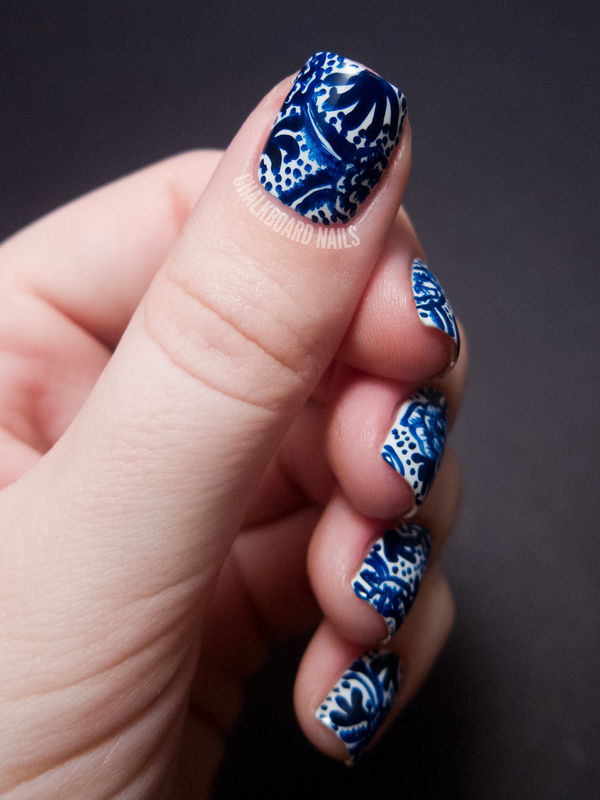 Then I freehanded on the pattern with a medium length striper brush using Cult Nails Time Traveler. The jellylike nature of Time Traveler really helped in creating a more authentic handpainted porcelain look. While looking for sample blue and white china patterns, I came across this teacup. I loved the designs on it. I thought the flower was beautiful, and I really enjoyed the swoop shapes. However, as you can see, I didn't quite copy the teacup exactly, and I didn't want to! 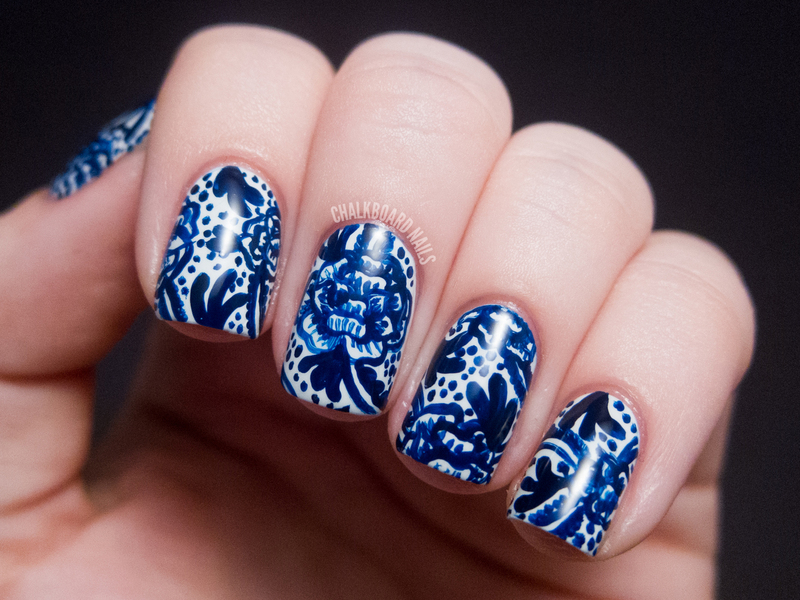 I was set on doing a full nail pattern and the teacup was a bit simpler than I was aiming for. So I just took elements, moved things around, and added pieces. Almost no planning went into this manicure... I just practiced the main flower one time and then sort of dove in, filling in areas with whatever I thought would look nice there. These are seriously my favorite nails that I've done in quite some time. 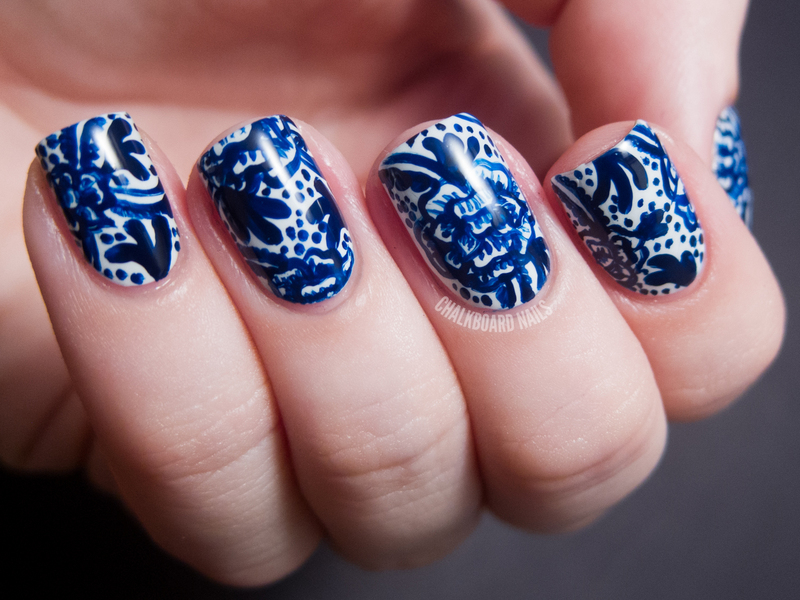 You can check out the upcoming challenge prompts here, and you can also take a look at last year's blue nails here. OMG, this is so good! Sarah!! These are beautiful! I think you've got more artistic talent in your pinky than I've got in my whole body! Oooooohhh!!! Very nice!!! Have you seen Tatty Devine's new willow plate jewellery collection? https://www.tattydevine.com/shop/by-product/collections/autumn-winter-2012/willow-pattern-set-large-necklace.html Your nails are very fitting to it!! This is so intricate and beautiful! I've always wanted to do a nail design based on a china pattern- this is gorgeous! 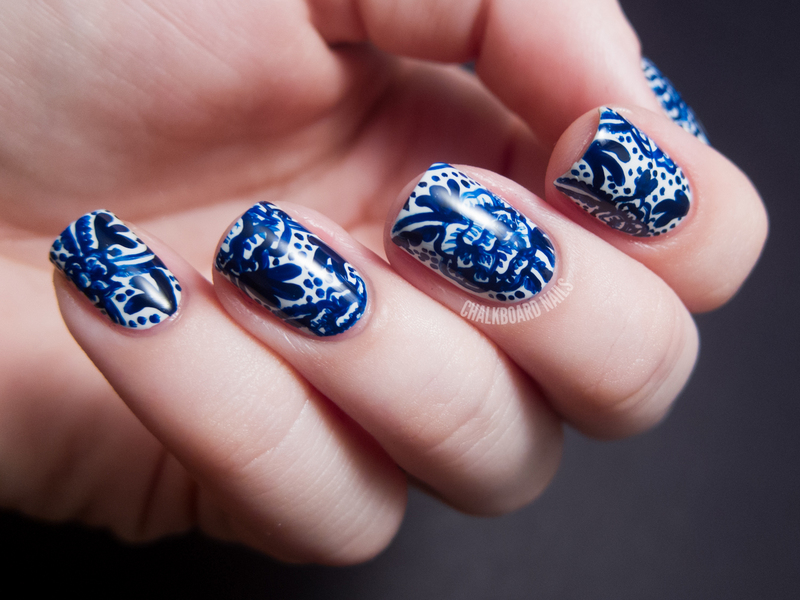 Very beautiful, I love the idea of delicate china on your nails! Are you kidding me? FREEHAND? I bow down to your skills! 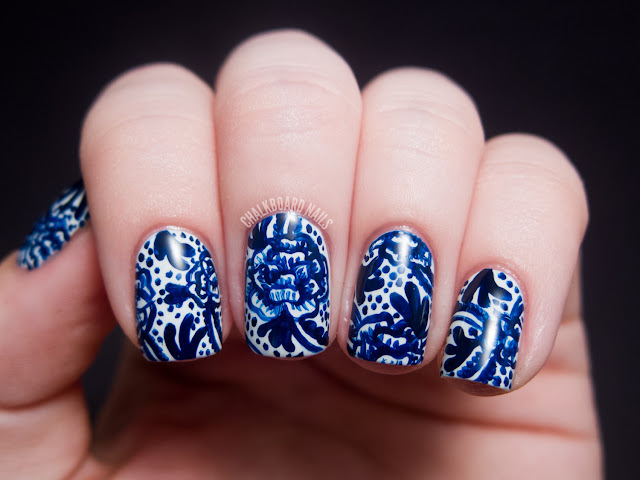 This is one of the most gorgeous manicures I've ever seen! How is it that my mom and sister are both hand models?? I must have gotten the ugly hand genes... thanks dad.... Anyway this design is SICK!! Keep it up sissy! These are so amazing - some of the best nail art I've ever, ever seen! Ok, this is just crazy in the best possible way. I'm amazed at your creativity! I cannot believe you free handed this design it is lovely. SOOOO gorgeous! That blue really is the perfect color for this design. I would NEVER take it off!!! They are simply beautiful. I am so in love with this design!! To one day be able to do things like this on my nails is my goal and your pictures showing all of the detail make it truly easy to grasp what you did. LOVE! LOVE! LOVE!! You my dear are a talent to be reckoned with for sure! I forgot to ask, how long did it take you to do this design? What a fabulous idea! It reminds me of my nan's kitchen - it was wall to wall blue china. This is gorgeous! The prettiest nail design I have ever seen. I love it! WOW! This has to be the most amazing polish art I have seen all yr! Know it's in the eye of the beholder but I love love this. 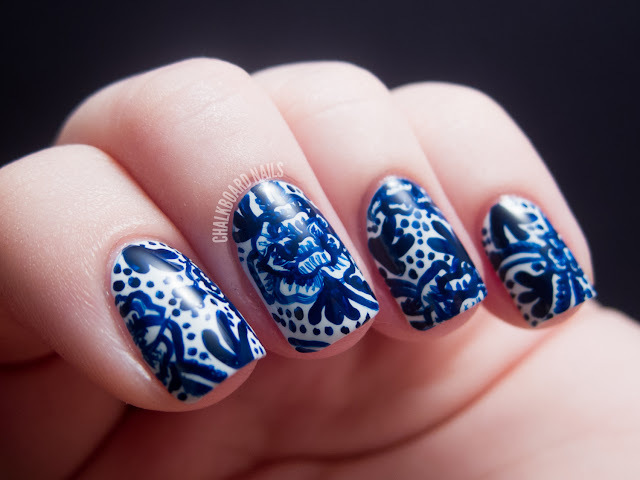 I have seen tons of flower art but never seen anyone do such a wonderful china blue/white pattern inspiration as this is! Applause! 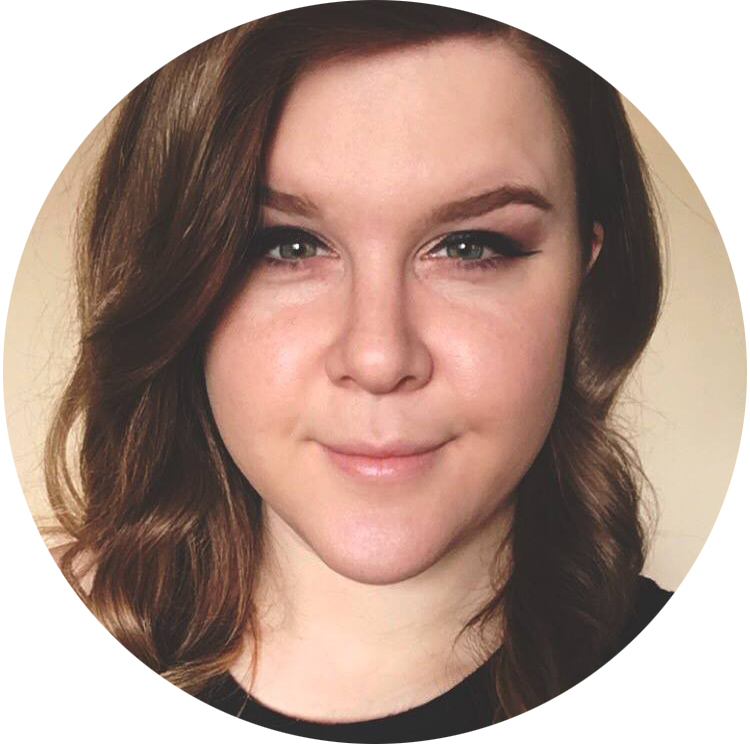 Seriously, I am BLOWN AWAY. Cannot believe you freehanded it, and also cannot believe how gorgeous. This manicure should become famous. LOL I _mean_! Wow! These are really beautiful! And quite impressive as well! That's amaze-balls (a cross between amazing and Spaceballs). I want to have your skill someday! I love these everyday inspirations!!! These are stunning. Breathtaking. Incredible! Wow, such a good job on the freehand painting! 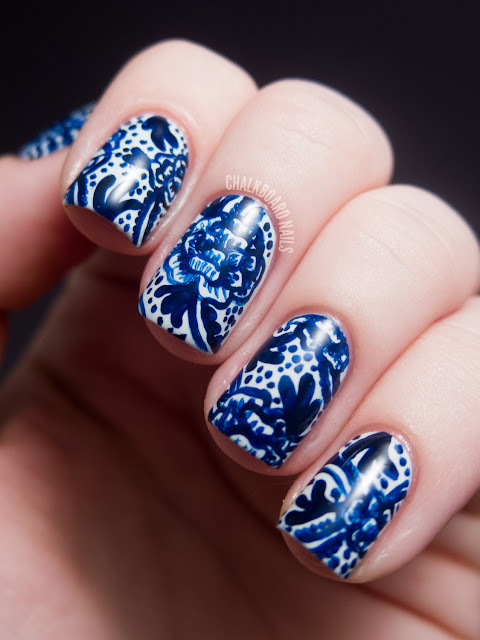 Really beautiful mani! I think this is my favorite from the challenge!